1. 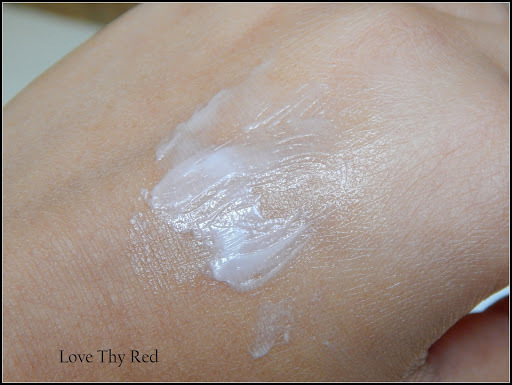 Shea butter moisturizes your dry hands. 2. Enjoy the mysterious and powdery floral scent. 3. The salve-type hand cream applies smoothly, without leaving any stickness on your skin. After washing your hands, apply an appropriate amount evenly onto the hands as you massage. The Innisfree Jeju Lotus Hand Creamwas an impulsive pick during my last haul at Innisfree about which I blogged HERE. Amongst the hordes of different fragrances that were on display at the store, the white packaging of this one appealed the most to me. Blame it on the excruciatingly hot summer days, I am practically unable to see past whites and pale pastel shades, be it my makeup, or my clothes. So anyway, I am happy that I picked this up because for the dry air conditioned environment that corporate slaves are subjected to, this just seems to be perfect! 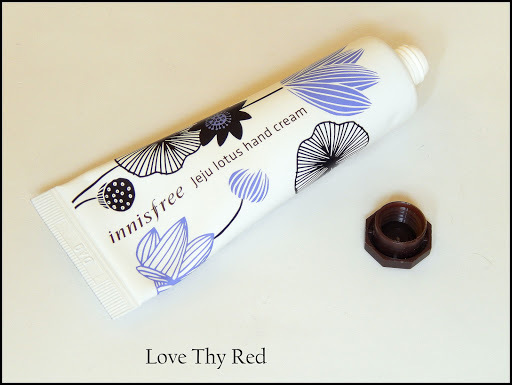 The Innisfree Jeju Lotus Hand Creamcomes in a mattified plastic tube with a screw top cap. I like the fact that the tube is not insanely large, so it doesn’t take up a large space either in my handbag or at my workstation. The packaging is hygienic, simple and pretty and thoughtfully designed. I love it! The formula is thick but not quite as heavy. The consistency makes the cream super easy to be absorbed in the skin and the formula provides intense moisture to someone with hands as dry as mine. The end effect is soft and supple looking hands without a hint of greasiness. That’s something really incredible I have to say! The Jeju Lotus Hand Creamhas asoft and powdery scent, atypical of Baby care products. It is a beautiful feminine scent that stays for upto an hour and more, or until you wash your hands. Innisfree, as a brand has thoroughly impressed me with this hand cream and there’s nothing that I don’t like about this particular hand cream. The nourishment it provides to my dry hands and the absolutely dry touch finish, coupled with the delicate powdery floral scent makes this cream an absolute essential this summers. In case you don’t like the scent you can go for other scents in this range like the gardenia or cedar wood ones which are next on my list. The choice of a scent is a very personal matter and so what appeals to me may or may not appeal to you, but don’t lose heart yet. There are more than 8-10 varieties of hand creams at Innisfree to choose from and looking at the wide array of scents available, from floral to woody, to musky and fresh, I’m sure you’re bound to find one for yourself. Amazing product, a must have from Innisfree!